Emmanuel Eboué (born 4 June 1983) is an Ivorian footballer who currently plays for Premier League club Arsenal. He plays in the right back position for the club, but is sometimes employed as a right midfielder. Eboué began his football career at the famous ASEC Mimosas youth academy, like former teammate Kolo Touré. In 2002, Eboué moved to ASEC's Belgian feeder club, Beveren, and spent three seasons there. His impressive performances in Belgium caught the eye of Arsenal scouts. Eboué's debut came only days after signing from Beveren, in the FA Cup against Stoke City. Although he was not initially a first team regular, making just one FA Premier League appearance, as a substitute, in 2004–05, Eboué was regularly in Arsenal's reserve team that season. In 2005–06, Eboué made his break into the Arsenal side. He started the season mainly as a reserve player, though he scored his first goal for Arsenal in the club's 3–0 League Cup third round victory at Sunderland on 25 October 2005. Despite leaving for the African Cup of Nations in January 2006, he was immediately sent into action on his return; he made his first career Premiership start at right back against Liverpool at Anfield, replacing the injured Lauren. With Lauren injured for the rest of the season, Eboué held his place for the remainder of Arsenal's 2005–06 campaign. Eboué's run in the Arsenal side included matches in the UEFA Champions League knockout phase against Real Madrid, Juventus, and Villarreal. Impressed with the way the Ivorian adapted to the increased pace of the Premiership and pressure of the Champions League, Arsenal manager Arsène Wenger even compared Eboué to the legendary Brazilian winger Garrincha after an energetic performance in the 1 April 2006 game against Aston Villa. Eboué continued in the starting line-up for Arsenal in the 2006 UEFA Champions League Final at the Stade de France. Eboué started the 2006–07, and was awarded the Arsenal Player of the Month award for September. However, he was injured in an international and spent the whole of the month of October out with injury. He made his first team return as a substitute in the 1–0 defeat by West Ham United on 5 November, and started the League Cup win over Everton later that same week. He scored his second Arsenal goal in their 3–1 Champions League victory over Hamburg on 21 November 2006. Persistent ankle problems have plagued him throughout December 2006 and January 2007. He attempted to make many comebacks, mostly against high profile teams such as Liverpool, in the FA 3rd Round and Manchester United, but he was unable to come through them unscathed. Wenger decided to wait until there was no chance that there would be a recurrence of the injury. He came off the bench for Armand Traoré in the League Cup final against Chelsea. He started the match against Blackburn Rovers in the FA cup 5th Round Replay, only for his ankle to get injured again from a studs-up challenge from Blackburn winger Morten Gamst Pedersen, which the referee also missed. In May 2007, Eboué signed a new long-term contract with Arsenal. From the start of the 2007–08 season, Arsène Wenger stated his intention to move Eboué into a role on the right wing, following the signing of Bacary Sagna. On 20 September 2008, Eboué scored his first Premier League goal against Bolton Wanderers in an away match, which Arsenal won 3–1. During the 2008–09 season, he was much maligned by certain fan sections after some less-than-satisfactory performances. This dip in form also mirrored poor form by the team as a whole and the absence of teammate Theo Walcott (who also has played regularly on the right wing) through injury. After a particularly difficult game on 6 December 2008, Eboué was substituted against Wigan Athletic, after he came on as a substitute and appeared visibly upset by the crowd's negative reaction to his performance. On 8 March 2009, he scored the third goal against Burnley in the FA Cup fifth round match. On 14 March, he scored two goals (one a penalty) in the Gunners' 4–0 hammering of Blackburn Rovers. In June 2009, Eboué revealed that he was unhappy at how the 2008–09 season had gone with Arsenal, and posited that he could leave the club in the future should things not improve for him. He scored his first goal of the season for Arsenal against Wigan Athletic on 19 September 2009, the fixture he was booed by his own fans in the previous season. On 9 March 2010, in the second leg of Arsenal's Champions League tie at home to Porto, Eboué scored the fourth goal in a 5–0 win having come on as a substitute. 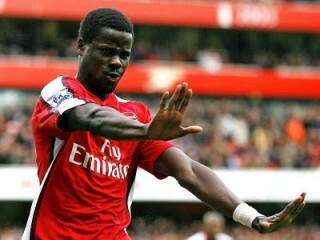 In March 2010, Eboué dismissed speculation he would leave Arsenal and pledged to see out the remainder of his contract. Eboué debuted for Côte d'Ivoire in 2004 and has generally been regular fixture in defense, along with former teammate Kolo Touré.On the 18th November 2009, Eboué scored his first goal for Ivory Coast in a 2-2 draw against Germany. View the full website biography of Emmanuel Eboué.